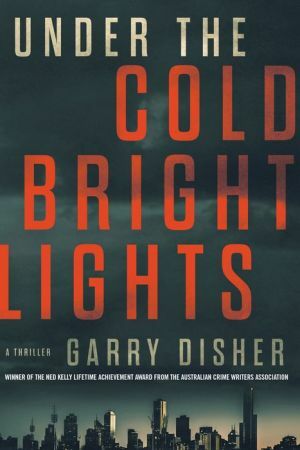 Under The Cold Bright Lights is a stand-alone crime novel by Australian author, Garry Disher. Five years retired, ex-homicide cop Alan Auhl is back on the job. But this time, he’s an Acting Sergeant in the Cold Case and Missing Persons Squad. At fifty-five, he’s the oldest member of the squad, attracting the nickname Retread, but he’s not really bothered by digs and insults from the younger cops. What does bother him is the unsolved case he caught the tail of, before he left the job: farmer John Elphick, found near his ute with fatal head injuries. Even in his retirement, John’s daughters rang him annually to see if there was any progress in the case. Now, he’s in exactly the right spot to follow it up. But before he gets a chance to do more than retrieve the old case files, his boss, Helen Colfax sends him out to Pearcedale, where a skeleton had been found under a concrete slab. A young male, murdered and concealed post 2008. Could he have been a tenant on the property? In between those investigations, Auhl’s attention is caught by the antics of a one Dr Alec Neill. This man, whose second wife died in somewhat suspicious circumstances when Auhl was still in Homicide, now claims his third wife poisoned the second wife as well as his current girlfriend, and fears for his own life. Auhl was unconvinced at the time that the first wife’s death was natural and believes Dr Neill is a serial killer. Auhl’s home scene can also be a little distracting: Chateau Auhl is a haven for waifs and strays, visiting professors, his own student daughter, his ex-wife (when she is in town), a cheated-on colleague and a battered wife seeking refuge for herself and her ten-year-old daughter. Auhl takes a supportive role with the latter pair who nervously accept his help. Is he getting too involved, though? Disher is a master of the Australian crime novel. His settings (inner city Melbourne, Geelong, country Victoria) are well conveyed, and his characters are easily believable. There’s plenty of fine detective work, as well as an abundance of dry wit and clever banter between the characters. All four story lines have credible plots, some of which feature twists and red herrings, and venture into the territory of fundamentalist religions, paedophiles and domestic abuse. Acting Sergeant Alan Auhl is difficult not to like, although his strong sense of justice and his resignation about the impotence of the legal system sometimes leads him to act beyond the its limits. Even though Disher’s website calls this a stand-alone crime novel, readers are bound to want more of Alan Auhl, so maybe he’ll be the start of a new series (fingers crossed). Excellent Aussie crime fiction.